For many years now, Avalanche Press has been built around the concept of the game series: a set of games with similar themes, using the same set of rules. The idea here is that players only need to learn the rules once; then they’re ready to play many other games straight out of the box. In this age of diminished leisure time, this has been a very popular feature and our core series remain very strong: Panzer Grenadier, Infantry Attacks, Second World War at Sea, Great War at Sea. Rome at War has the potential to become a series like those, with numerous boxed games and book supplements to open the entire world of ancient warfare to its players. 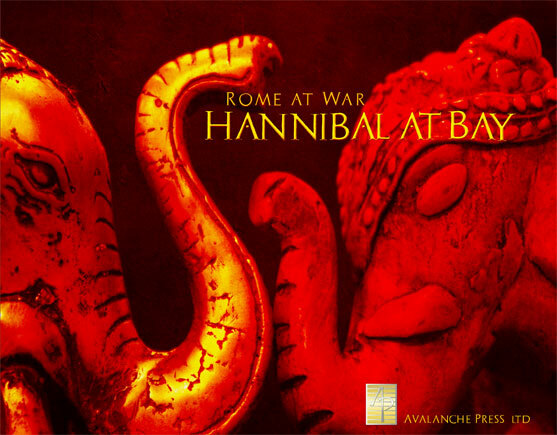 Those grand ambitions need to start somewhere, and for Rome at War, the starting place is Hannibal at Bay. For a small game, Hannibal at Bay has a whole lot to offer. It’s based on the last stand of one of history’s great generals, Hannibal Barca of Carthage, against one of history’s even greater generals, Scipio Africanus. You don’t need to know anything about wargames, Hannibal, Carthage or Rome to play this game. 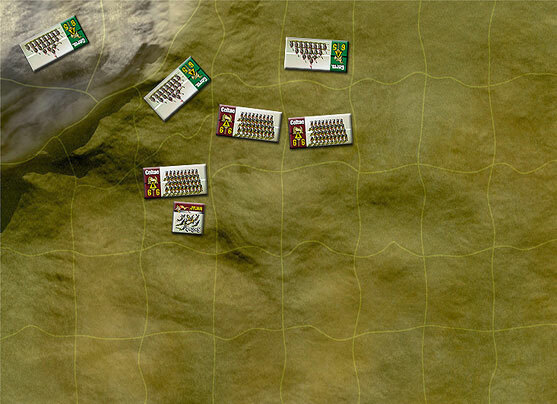 You activate formations, and send them into battle (each army is divided into two or three formations; better-led armies are easier to activate). When you engage the enemy, you resolve combat by rolling dice, with a 6 scoring a hit and reducing an enemy unit’s strength. A number of things can modify your strength, including leadership. You can learn to play the game in just five minutes using this handy guide. There are two maps, printed on heavy cardstock. If you have those from the first edition, these have much nicer artwork, by Guy Riessen (who did our 1940 maps among others). The intent is to use this style of map in all subsequent Rome at War games so players can build a library of maps similar to that of Panzer Grenadier, allowing them to play out many other battles on them. Best of all, the maps fit easily on a small table: you don’t need a ping-pong table, a specially-made gaming table, or even a large dining or conference table. Just a small card table, a coffee table, or even a night stand: the maximum area’s just 22x17 inches. Rome at War gives the players a gods’-eye view of ancient warfare that the great poet would have appreciated. The armies are arrayed across the map, with the big units (legions, phalanxes and such) not allowed to stack on top of one another. And there are no markers obscuring them, either: the lines of troops look just like those in the maps found in military histories. The playing pieces display your troops (and cavalry, and elephants, and catapults) from above and behind them, so you sort of hover over the battlefield like Zeus above Troy. There are five scenarios included with the game. The main event is the climactic Battle of Zama – Hannibal against Scipio in one of history’s decisive clashes. Others range from the clash of cavalry at the Watchtower of Agothocles to the large-scale Battle of the Great Plains between Scipio and Hasdrubal. Altogether it’s a great package, at a sweet price, opening the door to lots more fun. This is the sort of game that made you want to play wargames, if you do already, and will make you want to, if you don’t. Fight like a Roman! Put Hannibal at Bay on your gaming table today!